To write a successful novel, I have to dip my pen into autobiography; and if I don’t, I lose my way. This makes it difficult when I am writing fiction about a crime. It means weaving a tight narrative comprised of an act of violence and the mystery surrounding that act of violence with something substantial that I’ve lived through. I was lucky in my previous novel (Cloudland) that was based on the unsolved serial murders of seven women in a place called “the Upper Valley of Vermont and New Hampshire.” A very close friend of mine, who was like a mother figure to me, found the last of the victims: a woman in a pink parka whose body had been dumped in a snow bank adjacent to an apple orchard and who lay there for three months until a thaw. My friend told me her story of discovering the body over and over again, her reaction to seeing the dead woman, what happened afterwards, and I already knew how the shock waves of her discovery roiled the small town we lived in. I took that and fueled it with the memory of a solitary winter I spent in a nearby farmhouse that was on a road where cars often lost their way and stopped across from where I was living. Their headlights, like a pair of burning eyes, blistered through the windows and stunned me. I kept imagining that the car drivers had foul intentions, and I stayed on the lookout until the cars reversed and drove back the way they came. It kept happening over and over again, and it was eerie and spooky. I felt spiked by it. Some of my earlier autobiographical novels were praised for a kind of romantic lyricism, and I very much wanted to bring this element to my new novel, Black Diamond Fall. My instinct was to draw energy from the memory of a short-term very intense love affair, which is exactly what I did when I wrote my well-regarded novel, Nightswimmer. Nightswimmer romanticized swimming and I wanted Black Diamond Fall to romanticize skiing. But writing in the crime genre required me to create a mystery around acts of violence or, possibly, murder, and I found myself drawn to two events that happened at Middlebury College between 2010 and 2012. A student from Arizona stayed on campus during the winter break, and one cold night, after drinking a few beers, he had an argument with a friend, went for a walk to “cool off” and subsequently vanished. Once he was determined to be missing, searches were organized. Middlebury students returning from vacation, as well as the townspeople, participated in protracted searches, but there were no leads and the young man’s disappearance went unsolved and unexplained. At one point during the search, a scrawl of graffiti and a smiley face were found on the corrugated metal wall of a makeshift warehouse that was in the general vicinity of where the student was thought to have disappeared. Those black markings were consistent with the hieroglyphs that punctuated the sites of a host of other unsolved murders of college students committed by a group that left a “smiley face” near to where they dumped the body of the victim. But it was eventually determined that these markings (in Middlebury) were coincidental. Several months later in the summer the young man’s body was found at the bottom of the Otter Creek. It was determined that he somehow fell in and during the middle of winter and succumbed quickly to the 35-degree water. Like any informed Vermonter, I knew about this missing student, but his disappearance really began to resonate with me when a friend of mine, a psychic, was called in to try and figure out what happened. This is the woman who appeared—she portrayed herself—in my previous novel, Cloudland, and for a while—before I decided that she didn’t belong—she was a character in Black Diamond Fall. The psychic met the missing student’s mother and his aunts who came to stay Middlebury and who spent an anguished period of waiting for clues to his mysterious vanishing, waiting for anything that might explain what happened. My friend saw it all accurately, saw him lying at the bottom of the river, and tried to tell them. And when she was telling me it became clear that having a vision of what had happened affected her very deeply; after all, she too, was a mother. Then, within a year or two of this young man’s death, some high school kids broke into the main house at the Robert Frost farm very near to the Middlebury Campus. They got drunk and defiled the poet’s residence. This, too, created shock waves and generated one of the first discussions of the opioid crisis in the state of Vermont. Ironically, the punishment meted out to these students was being forced to study the poetry of Robert Frost with Middlebury College’s resident Robert Frost scholar. My gut told me to write a novel in which the disappearance of the student and the defiling of the Frost farm happen concurrently, and in the writing to try and figure out some other event or person who could link the two of them. 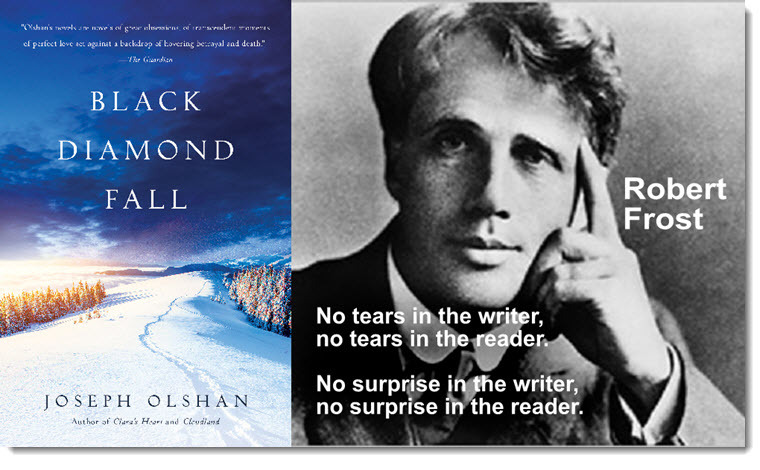 Just as in Cloudland, where the mystery is intertwined with a rare and forgotten manuscript by Wilkie Collins, Black Diamond Fall is threaded with the vandalism of the Frost Farm and the writer’s poetry. The Middlebury student who disappears is the son of the docent of The Frost Farm and the detectives investigating sense there is a connection. But most of all, my gut told me that, just like in Nightswimmer, the center of the novel needed to be the story of a tragic love affair. And that one of the lovers needed to come under suspicion for causing the disappearance of the other lover, the young man who was missing. Another fine book authored by Joseph Olshan is Clara’s Heart. © 2019 · Delphinium Books. All rights reserved.